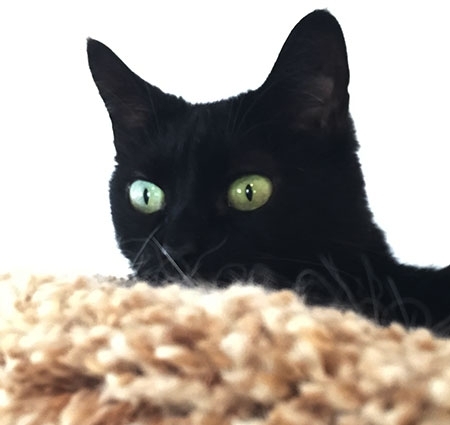 Raven came to us a few years ago as a kitten along with her mother, Lacey and her two sisters, Jasmine and Kali. Lacey brought the three identical, black kittens to our home's porch to show them where they could find food. For weeks, we tried to tame the kittens without much luck. For their safety, we felt they could not be returned to the woods where they came from. So after they were all spayed and vaccinated, they settled in to live with us at the sanctuary. They have all grown up to be absolutely beautiful girls. Raven is the smallest of the litter. She will stay nearby as we are feeding meals or cleaning but will dart out the cat door if we make a move towards her. We often see her with her mom and siblings in a big cuddle pile on the deck. We are thankful we do not have to worry about this little family living in the woods where their mom was dumped. Want to Sponsor Raven? Click here to become a Sponsor.